The Direct Way To Inner Happiness. We love to meditate; it’s really our favorite activity, like hanging out with a very near and dear friend. We’ve both been meditating since our early 20s and together for the last 26. We have no idea who we would be nor how we could live in this mad and crazy world without it. But one thing’s for sure: whenever we run into a difference of opinion (Ed thinks the ceiling is flat while Deb thinks it’s white) it’s only when we sit to meditate that such differences dissolve (the ceiling is both flat and white). Ed trained in India in the yoga tradition, Deb in Buddhism, but we’ve dropped the ‘isms’ and go by what our hearts tell us. Often we just sit in quiet emptiness (which is so rich and full! ); other times we focus on loving kindness for ourselves and others; and sometimes we do walking meditation or recite mantras. Meditation is about being totally present, so whatever we do brings us back to center, back to awareness, freedom, radiant emptiness. We are passionate about teaching meditation—although strictly speaking no one can teach it, merely point the way, like a finger pointing to the moon yet it is not the moon. We love seeing the ‘aha’ moment when someone lets go of thinking they can’t do it and ‘gets’ what meditation is really about—just being present with what is, as it is. Sitting quietly enables us to go beyond our limited self and enter into a great spaciousness. We assure you—it’s the greatest gift you can give yourself! 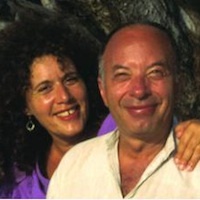 This meditation opens your heart by developing loving kindness. Start by breathing into the area of your heart, softening and relaxing with the in-breath, and letting go of tension on the out-breath. Hold your name or an image of yourself in your heart and silently repeat: May I be well, may I be happy, may I be filled with loving kindness. Do this for five minutes or more. Then silently wish all beings be well, all beings be happy. If you are at work you can spend a few minutes repeating the names of the people you work with and wishing them happiness and joy. On your way home from work reflect on your day and generate loving thoughts to all those you met. At night, think of each member of your family and wish them wellness and happiness: May they be well, may they be happy, may they be filled with loving kindness. Do this for five or more minutes. 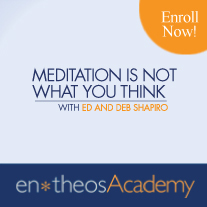 Join Ed and Deb for a 4 week on-line course on discovering the greatest gift you can give yourself: meditation. Clear your mind, open your heart, and dive into the wonder of your own true self. Starts July 09! Just intro'd on FB to : I'm not Spiritual, & WOW.